TONIGHT: The Mudcats begin a seven game road trip tonight with game one of a four game series versus the Salem Red Sox at Haley Toyota Field in Salem, VA. Tonight's game is the 8th meeting of 11 total between the two teams this season. The Mudcats lead the season series 4-3 and are 3-1 in Salem so far this season. ICYMI: Cooper Hummel started the ninth with a double and went on to score from third moments later on a chopper to second from Nathan Rodriguez as the Mudcats walked-off for the tenth time this season while avoiding a series sweep with a 5-4 home win versus the Hillcats on Wednesday night at Five County Stadium. WHERE THEY RANK: RHP Luke Barker leads the Carolina League in saves (16) and games finished (31). Barker is also 2nd in games (39), tied for 2nd among CL relievers in lowest batting average (.206), 1st in fewest baserunners/9ip (8.72) and 4th in lowest BB/9ip ratio (1.92)… INF Dallas Carroll is currently tied for 2nd in the CL in games played (111), 2nd in at bats (425) and 3rd in most walks (55). TRENDING: INF/OF Ryan Aguilar is batting .400/.500/.800 over his last five games (6-for-15, 4 R, 3 2B, 1 HR, 1 RBI, 3 BB, 1 SO)... C Mario Feliciano is batting .371/.439/.600 over his last 10 games (13-for-35, 6 R, 5 2B, 1 HR, 5 RBI, 4 BB, 10 SO)... LHP Daniel Brown has totaled 19 strikeouts over his last five appearances and last 11.1 innings pitched. OF LATE: The Mudcats are just 2-8 since Weston Wilson missed his first game due to injury on July 29 (2.5 R/G, .164 w/RISP)... As a team, the Mudcats have struck out in 34.6% of their plate appearances in August (6 G). 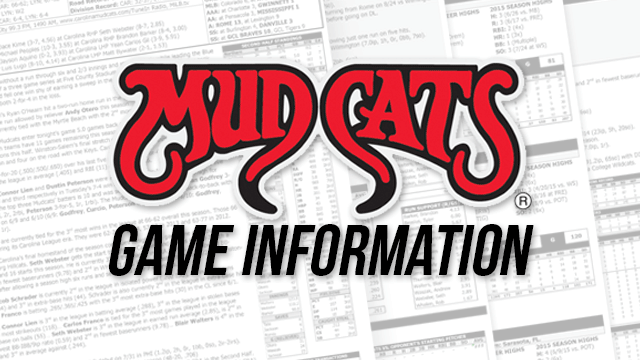 The Mudcats have also walked in 13.1% of plate appearances this month (BB% by month: 10.3% in July, 8.4% in June, 9.3% in May and 10.1% in April). MUDDIES ON THE POND: The Carolina offense is currently last in the CL when batting with runners on base (.234 / .665 OPS), last when batting with runners in scoring position (.231 / .675 OPS), last when batting with runners in scoring position with 2-outs in an inning. (.216 / .672 OPS) and 8th when batting with the bases loaded (.211 / .620 OPS). INSERT HUMMEL: Cooper Hummel is hitting .303/.425/.495 with a .920 OPS (30 H, 16 R, 13 2B, 2 HR, 16 RBI) since replacing an injured Tucker Neuhaus in the fourth inning of a home game versus the Keys on July 6. Hummel ended up going 1-for-2 with a two-run home run (eventual game winner in the seventh) in that same game and has not missed a start since (30 consecutive games). HITS AND Ks: The Carolina offense has totaled 210 more strikeouts than hits (1078 SO, 868 H) so far this season. Carolina's difference in strikeouts over hits is currently the 4th largest in MiLB. Since 1991, only the 2017 and 2007 Mudcats have finished a season with more strikeouts than hits. Carolina totaled 164 more strikeouts than hits in 2017 (1,245 SO [franchise record], 1,081 H) and 70 more strikeouts than hits in 2007 (1,219 SO, 1,149 H). ALL THE Ks: The Mudcats offense has combined to total a CL high 1,078 strikeouts this season (on pace for 1,305 SO). Carolina is currently 11th in most strikeouts among all MiLB teams. The Carolina offense struck out a Carolina League and franchise record 1,245 times last season. The previous league record (per the 2017 Carolina League Media Guide) was 1,198 strikeouts and was set by the 1990 Lynchburg Hillcats. ... Totaled the 2nd fewest runs (448) in the CL this season. ... Allowed the 3rd fewest runs (474) in the CL this season. ... Gone 6-4 (.625) in doubleheaders this season. ... Gone 20-18 (.514) vs. the CL Northern Division.